Sigma Gamma Gamma Chapter of Omega Psi Phi Fraternity, Inc. 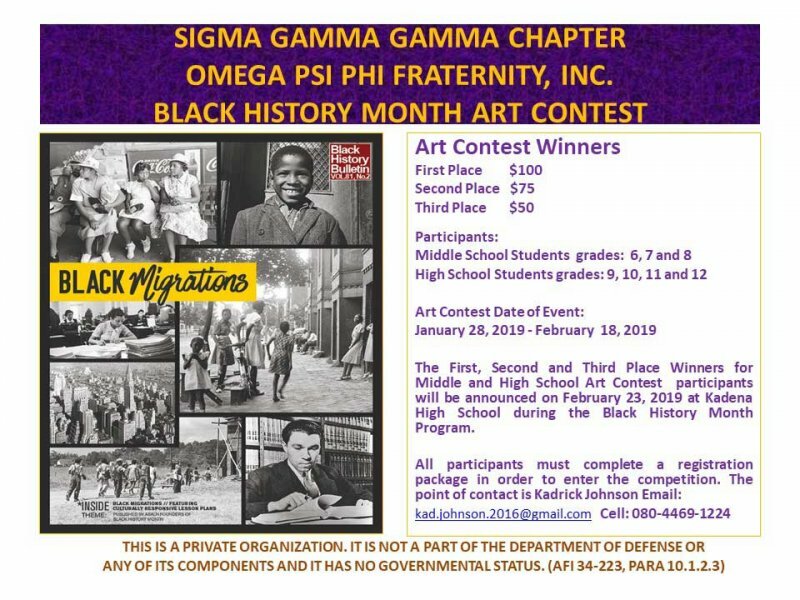 The Brothers of Sigma Gamma Gamma Chapter of Omega Psi Phi Fraternity, Inc. invites middle and high school students in grades 6th – 12th to participate in the 4th Annual Art Contest to be held starting Monday, January 28, 2019 through Monday, February 18, 2019. The 2019 theme Black Migrations emphasizes the movement of people of African descent to new destinations and subsequently to new social realities. While inclusive of earlier centuries, this theme focuses especially on the twentieth century through today. Beginning in the early decades of the twentieth century, African American migration patterns included relocation from southern farms to southern cities; from the South to the Northeast, Midwest, and West; from the Caribbean to US cities as well as to migrant labor farms; and the emigration of noted African Americans to Africa and to European cities, such as Paris and London, after the end of World War I and World War II. Such migrations resulted in a more diverse and stratified interracial and intra-racial urban population amid a changing social milieu, such as the rise of the Garvey movement in New York, Detroit, and New Orleans; the emergence of both black industrial workers and black entrepreneurs; the growing number and variety of urban churches and new religions; new music forms like ragtime, blues, and jazz; white backlash as in the Red Summer of 1919; the blossoming of visual and literary arts, as in New York, Washington, D.C., Chicago, and Paris in the 1910s and 1920s. The theme Black Migrations equally lends itself to the exploration of the century’s later decades from spatial and social perspectives, with attention to “new” African Americans because of the burgeoning African and Caribbean population in the US; Northern African Americans’ return to the South; racial suburbanization; inner-city hyper ghettoization; health and environment; civil rights and protest activism; electoral politics; mass incarceration; and dynamic cultural production. The art presentation must be original neither previously published nor secured by copyrighted material. If you would like to participate in the Black History Art Contest, please contact Kadrick Johnson Email: kad.johnson.2016@gmail.com The deadline for all entries is no later than midnight Monday, February 18, 2019.